The KickLite stocks are fitted with the exclusive, patent pending recoil reduction system. Answering the call for recoil suppression the ‘Kick Lite’ series was engineered and designed with shooters of all sizes, strengths and body types in mind. The fully integrated and virtually maintenance free system greatly reduces the perceived felt impact of shotgun loads without compromising the look, feel or function of your shotgun. Extremely popular with female shooters, youth and smaller framed individuals, as well as the ‘big guys’ who can do without the shoulder pain often associated with a long day in the field. * Designed for AK models, and Saiga shotguns and rifles with a pistol grip installed onto the reciever. * 6 position length adjustment system. * Goes from 11-1/2" length of pull to 15" length of pull. * Recoil suppression system reduces recoil by 50%. * Manufactured from glass filled nylon for superior strength and durability. 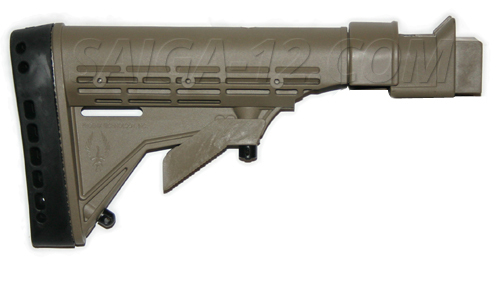 Counts as 1 US made, 922R compliant, parts. We strongly recommend to verify with your local law enforcement that it is legal to use this part in your state. Additional Set of Rails in Black?